Here in the Wolds, summer has been rather slow arriving, with the Hawthorn flower very late indeed flowering. I gathered mine only last week for tincturing, and there is still a plentiful amount of it on the hedgerows hereabouts. In the kitchen the tincturing is proceeding apace, with violet leaf and flower, ground elder, nettle, hawthorn flower and cleavers tinctures ready for pressing and bottling in the next day or so, then I’ll need to collect up my basket and my gathering bags and go foraging for the next load of goodies – this time will be ground ivy, silverweed and wood avens, and perhaps some white archangel for the tincturing jars. The garden is growing like a wild thing, and we finally relented and cut the grass this morning before it took over the whole garden and turned it into a jungle – as it was, the herb garden I put in back in January was fast becoming lost amidst waving stands of grass and plantain flower heads! In the kitchen I have bunches of ground elder, herb robert and wood avens drying along the rafters and baskets of plantain leaf dehydrating in baskets, and the first loads of dried herbs have been put away. 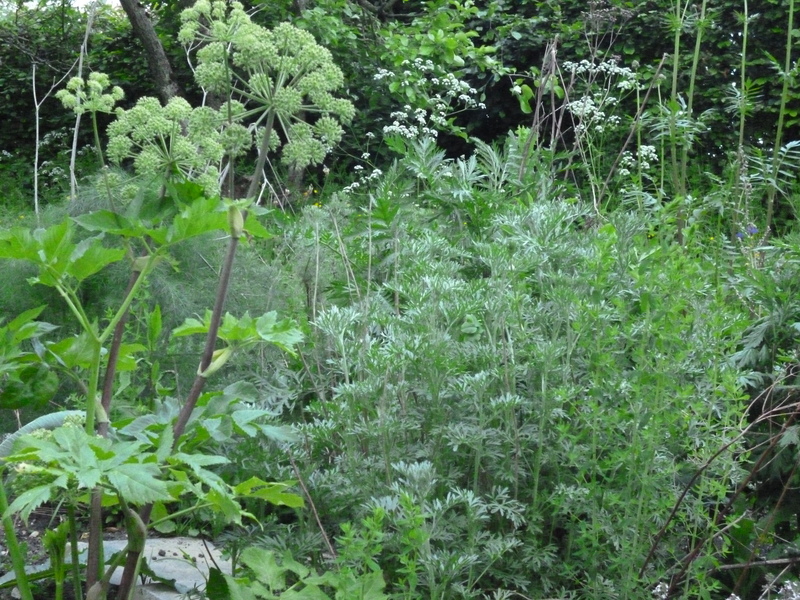 I both love and hate this time of year – everything is so green and lush but the frantic panic to keep on top of the herb gathering and drying does get a little wearing sometimes! 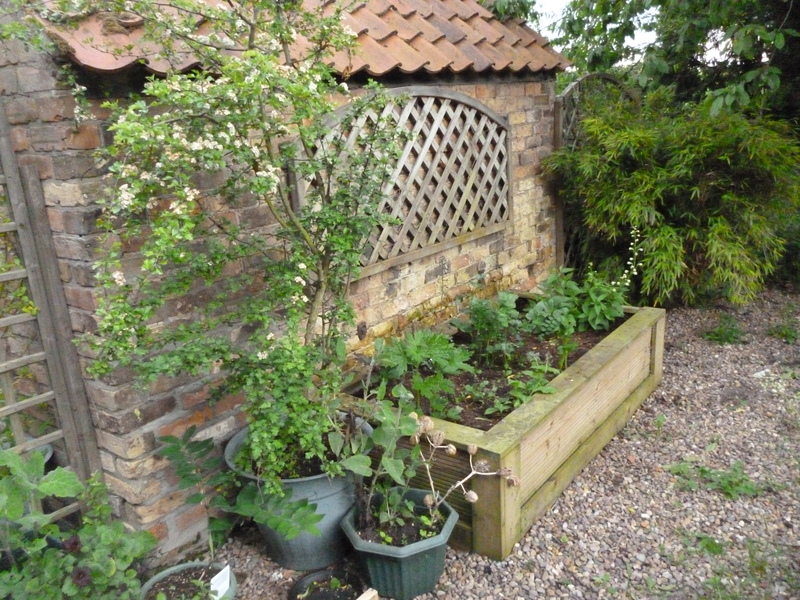 Part of the garden – weeding the gravel is proving fun as trying to decide what to allow to grow is getting more and more difficult – so many plants are useful! This year has brought the additional challenge of the almost complete collapse of my herbal practice last month, which I have had to concede is probably permanent. Too many herbalists in these parts, it would seem! The teaching, however, is going really well and is getting lots of delighted reviews from those who attend. Now that I’ve had time to adjust to the notion, a period of time to catch up on my reading, writing, learning and herbal experiments is much needed and long overdue – I never actually wanted to practice as a herbalist when I first graduated from university, as my first love and fascination was always with the plants, and it is to those that I very gratefully turn my attention once more. So now I am spending more time in the garden with my plants, more time roaming the hedgerows and gathering herbs in for drying and medicine making, and lots more time reading and writing – the most recent delight has been Plant Healer magazine, which, despite being mostly American in influence, is still a rich source of inspiration and much needed nourishment. I highly recommend it to any who are interested in herbs! The rest of this year will see much more regular updates, which will include book reviews, herbal gossip and ponderings, hedgerow ramblings and musings, and many more recipes. I’ve been very lax about this in the past, but now that one side of things has died back somewhat, I have more time to get organised! Wishing you all a warm, happy and successful summer! A wonderful site written by a lovely lady.